The best time of the year is officially here! 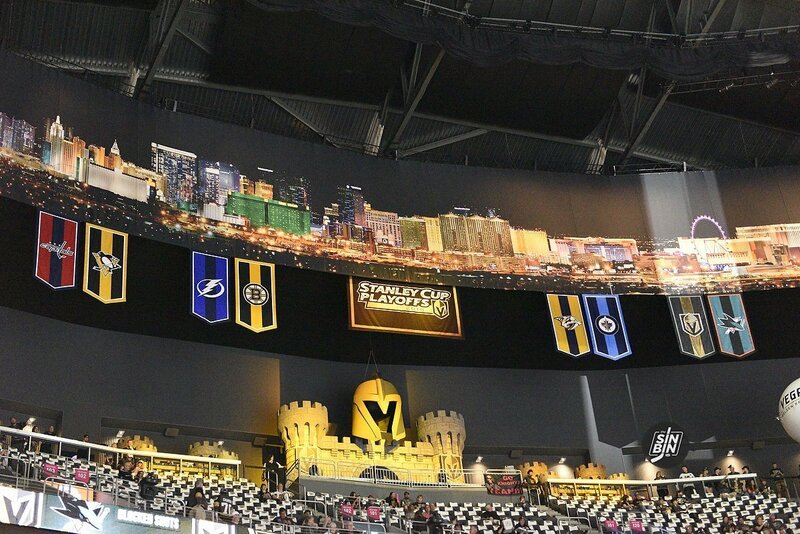 The NHL playoffs get underway on April 10th, and the NHL has just announced that the Golden Knights and Sharks series will begin that night. Here is the full schedule for the series. The NHL playoffs officially get underway on April 10th. However, not all of the eight series will start that day. Instead, at least three will start the following night on the 11th. The schedule will not be released until Saturday at the earliest, but using some deductive reasoning we believe Vegas and San Jose will start on April 11th with games every other night through the 23rd. Here’s how we came to that conclusion. As of this moment, only three teams have officially locked in home-ice advantage in the first round. They are Tampa Bay, Calgary, and San Jose. However, it seems fairly likely that Boston and Washington have their spaces under control. That leaves three we are waiting for. The two series from the Central will start in two of the three of Winnipeg, Nashville, and St. Louis, so we’ll account for all three of those options. As for the Metropolitan, it looks like it’ll be in New York (Islanders) or Pittsburgh, again, we’ll account for both. The best way to predict when each series will begin is to look at the arenas each team play in and see which dates are unavailable. Here are how all 10 arenas look for April 10th through 14th. I was watching the NHL All-Star Game last Saturday and looking forward to a fun evening of hockey. Then Lauren Jauregui ruined it. Understand that I usually don’t rant about national anthems, or pregame routines in general. Whether they are singers who perform or athletes who choose to stand respectfully (see Nate Schmidt) or prefer to kneel (Colin Kaepernick) I respect everyone’s right to sing it and listen to it however they choose. I know it’s not an easy song to sing and I have been in every NHL arena and have heard it butchered more than once. So this isn’t about Lauren Jauergui. If she wants to sing it her way, fine. I also don’t have to like it. This is about Carnell Johnson, a man who sings it the right way every time. No schmaltz. No interpretation. He sings it the way it’s supposed to be sung — with respect for flag and for country. Johnson is a 37-year-old Las Vegan who is a trained bass-baritone singer. He works as a gondolier at The Venetian and when (Pippo, his gondolier name) is on the job, he is the most requested person. The man they call “Golden Pipes” is as good as any anthem singer you’ll find in any sport, anywhere. Yes, Jim Cornelison is considered the gold standard in the NHL. Johnson himself says the man at the United Center whose voice cannot be drowned out by the Chicago Blackhawks’ fans and who points to the stars and stripes when he sings “that our flag was still there …” is legendary. Whenever NBC does a Blackhawks game in Chicago, it will show Cornelison on the telecast. Maybe it’s in Doc Emrick’s contract. And there are plenty of other wonderful performers across the NHL. I still think Roger Doucet, who sang “O Canada” at the Montreal Forum during the 1970s and sang it bilingually, is the greatest anthem singer ever. 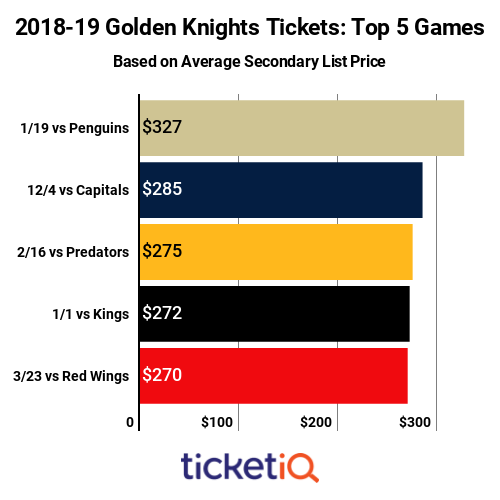 For the better part of a year and a half, the Golden Knights’ home building has rocked like it’s a playoff game every night. The raucous Vegas crowd aids their team when the Golden Knights are playing sluggish, or down a goal. 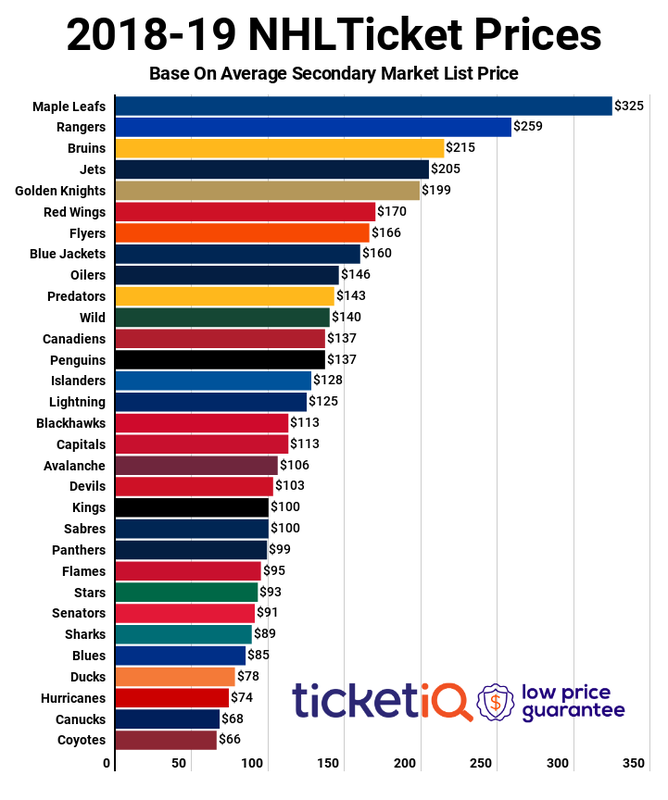 It’s why home ice advantage can be important. In Las Vegas it’s made a difference. 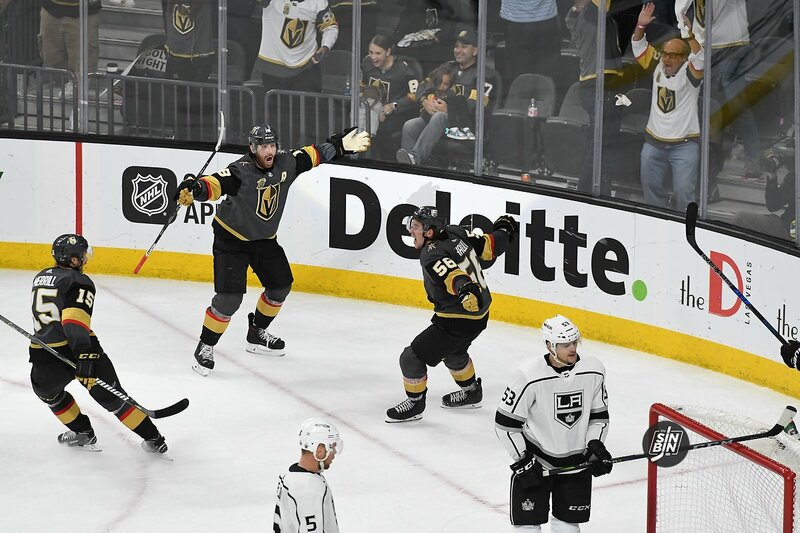 Several Golden Knights players have spoken about the advantage the atmosphere of the T-Mobile Arena and Vegas fans give them during a game. Players tell us all the time that playing in their home building gets them amped up before and during games. Well, it happens to the opposition as well. Is it possible that the nightly postseason atmosphere can have a reverse effect? After their win against the Golden Knights, Wild players admitted they got a boost of energy playing in the T-Mobile Arena’s atmosphere. In fact, it may have helped them get back in the game and eventually win it. Nashville said the same. Las Vegas Is An NHL Town; Can It Be A College Hockey Town? 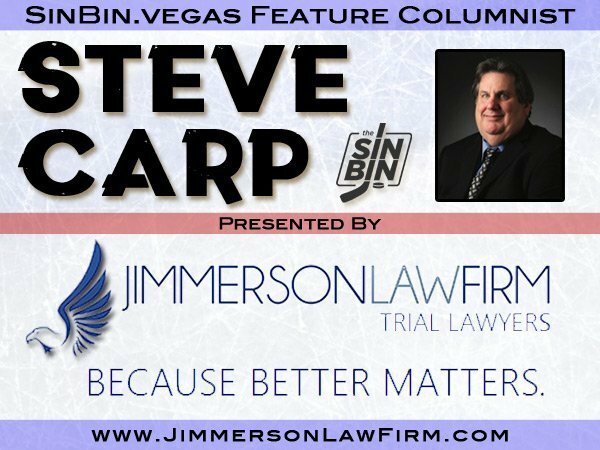 Late in my chat with Bill Foley a couple of weeks ago, we got around to briefly talking about high school hockey in Las Vegas and how it was important to launch the sport in town to help grow the game. Unfortunately, we didn’t get the opportunity to talk college hockey. This weekend, four NCAA Division I teams — Western Michigan, Connecticut, Air Force and St. Lawrence played at T-Mobile Arena in the 2nd annual Ice Vegas Invitational which was won by WMU, 4-1 over Air Force (Uconn beat St. Lawrence 6-3 in the third place game). It was a nice event and even though it was sparsely attended (Just 1,800 on Saturday), it will hopefully be a forbearer for the future. My hope is we’ll have the NCAA Frozen Four championship here and perhaps UNLV will one day be a participant once it goes Division I. Pipe dream you say? A realistic possibility, says me. Let’s start with bringing the Frozen Four to Vegas. With the NCAA willing to host championship events in cities that have legalized sports betting — Yeah, Vegas qualifies! (LOL) — the possibility exists that a Frozen Four could land here. With the hotels, casinos, restaurants, clubs, shopping and temperate weather, Las Vegas would be a great host city. Fans would love to come here for the weekend and root their teams to the title. The locals, at least the smart ones, would be part of a likely sellout crowd. The Golden Knights would obviously be on the road for what would correspond to the final week of the NHL regular season. But that’s easily done. Unfortunately, they would also be out of town the second week of March as the Pac-12 basketball tournament takes over the T. So two of the final four weeks would see the Knights on the road, and if they are in a battle for a playoff spot or division title, being away from home could potentially prove problematic. But the overall good of the game would trump any inconveniences. College hockey has been a proven breeding ground for future NHL players. Just look at the Golden Knights’ current roster — Nate Schmidt and Erik Haula (Minnesota), Alex Tuch (Boston College), Max Pacioretty and Jon Merrill (Michigan), Brad Hunt (Bemidji State) and Paul Stastny (Denver) all played collegiately. Having the Frozen Four would no doubt motivate local kids to pursue the game at a higher level and try to get to the NHL through the college route. Which brings me to UNLV. As most of you know, the Rebels have been skating as a club program for over 15 years. They currently play at the Division I level of the American Collegiate Hockey Association. They sell out City National Arena and they have a strong following, both on campus and in the community. You may also know the program is aspiring to go varsity, and do it soon. They were making some headway with then-president Len Jessup and then-athletic director Tina Kunzer-Murphy. They had secured some of the $15 million the team thought it would take to go varsity, including providing funding for a women’s sport, most likely lacrosse, though hockey wasn’t completely out of the question. Saturday night, T-Mobile Arena hosted 22,000 boxing fans for one of the biggest events of the year, GGG vs. Canelo. The fight got underway at around 8:30 PM Vegas time and the arena wasn’t cleared out until nearly midnight. 17 hours later, the arena was needed for an NHL preseason game. Oh, and all the while, the temperature outside was nearly 100 degrees the entire weekend. 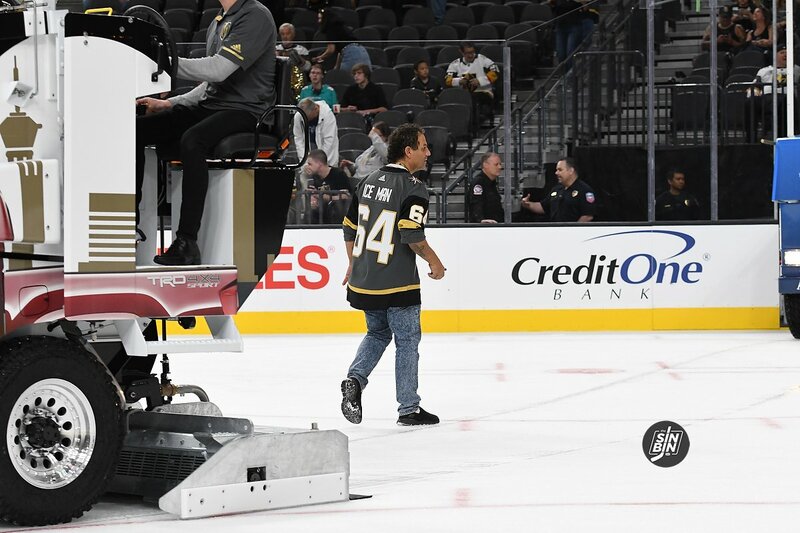 As impressive as the Golden Knights were in their inaugural season, the ice crew at T-Mobile Arena gave them a run for their money at defying the odds. 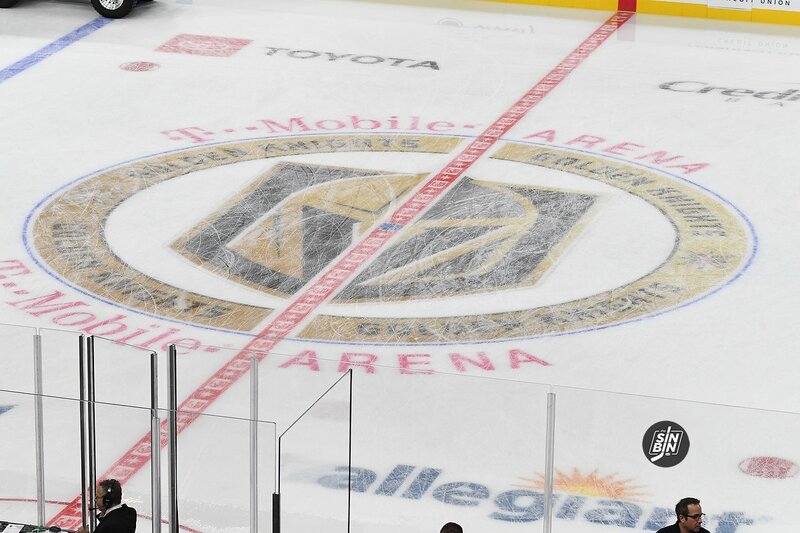 Last year George Salami, T-Mobile Arena’s Ice Ops Manager, also known as “The Ice Man” and his crew dealt with basketball, MMA, boxing, bull riding, WWE, concerts, and scorching heat, and not one time all year was there a legitimate issue with the ice. Ice condition concerns can be added to the long list of invalidated claims outsiders made before the NHL came to Vegas. 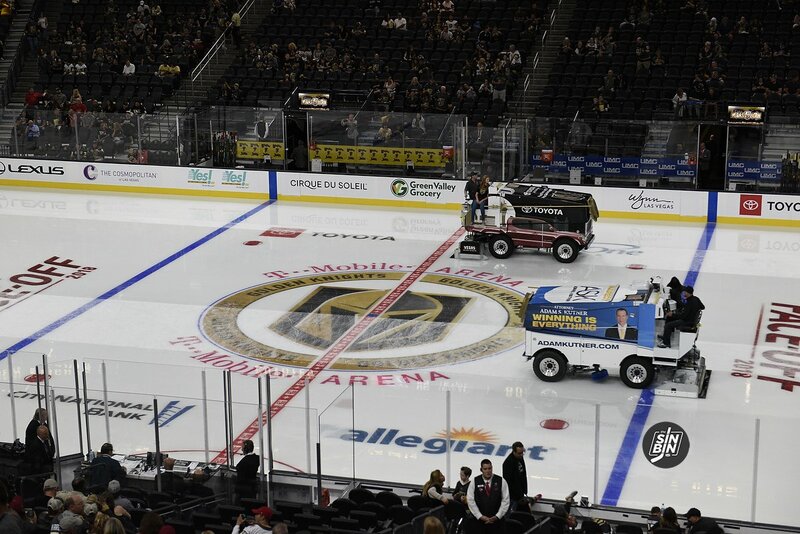 The crew at T-Mobile Arena dealt with some of the toughest conditions in the league and consistently overcome them to put out not only an acceptable playing surface, but a first-class one. Nic Hague got a chance to skate at T-Mobile Arena for the first time on Sunday, and he was blown away. It’s a little thing that most people don’t think about, but poor ice conditions can become a major black eye on an arena, a franchise, and even the city. Luckily, Salami and Co. are as good as it gets, no matter what the desert (or MGM/AEG) throw at them. It seems like it’s been forever since Vegas ended their season, and that was after a run to the Cup Final. Imagine what it must feel like for those teams who were eliminated in April. Luckily, we’re only 77 days away from the Golden Knights first game against the Flyers on October 4th. So, while we continue to wait, and wait, and wait, let’s look ahead to a few key matchups. This is the Golden Knights first Pacific opponent, and it’s the second game of a five-game homestand. Last season by mid-October, Vegas was 6-1-0 and sitting on top of the Pacific standings. Can they get off to another good start? Playing Anaheim will be a good early season measurement for Vegas. Nashville is expected to be a top Stanley Cup contender again this upcoming season. It’s a great test for the 2018-19 Golden Knights on the road, in a loud environment. Both teams have high expectations, so a late October tilt will be fun for fans to watch. Vegas fans will get to watch the talented Predators at the T-Mobile arena on January 23rd. This could be the Erik Karlsson preview game. General Manager George McPhee is known for making early season trades. Possibly, the Ottawa staff will like what they see in person, and accept a swap for E. Karlsson. 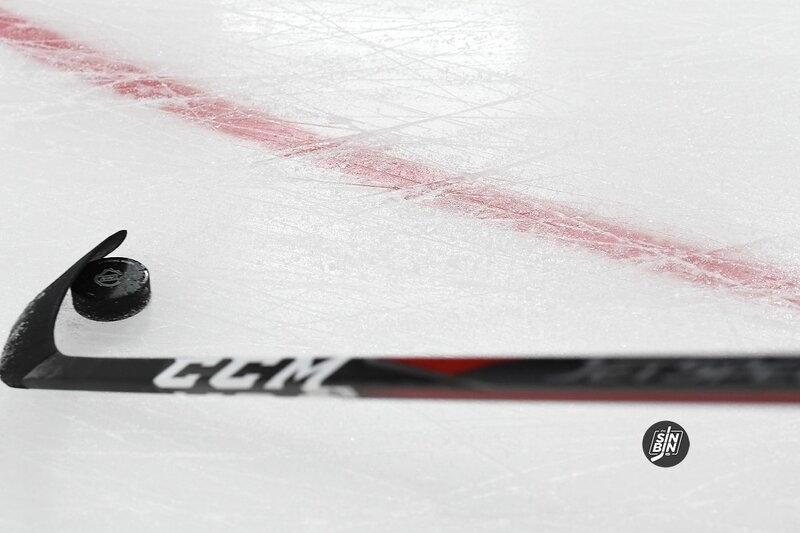 On his last season before free agency, the Swede will be playing in superstar mode all season. Playing well against Vegas could help get the trade moving. Or, maybe Karlsson will be making his return to Ottawa in a Golden Knights jersey. Or, he’ll be on another team by then and this game will be useless. It’s the return of the “Real Deal” James Neal. 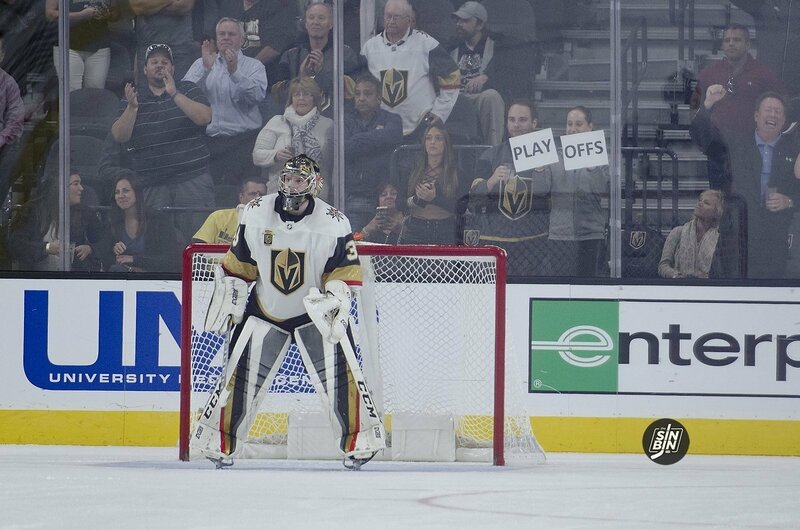 Expect the game to run behind schedule, as Vegas fans will be giving the former Knight multiple ovations before puck drop. Another angle in this game is the new look Flames. 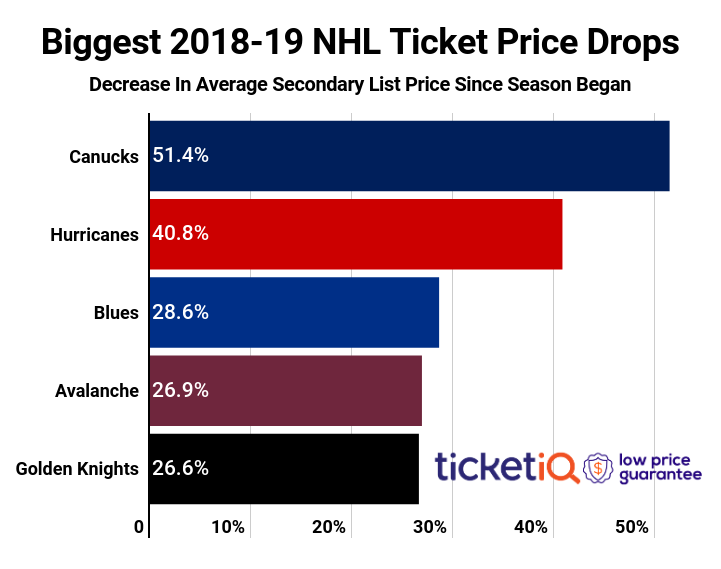 Calgary is expected to compete in the Pacific despite all of their new changes. The Flames are trying to compete now, which is why Neal was attractive to Calgary. It was always going to be special, just how special though was yet to be seen. 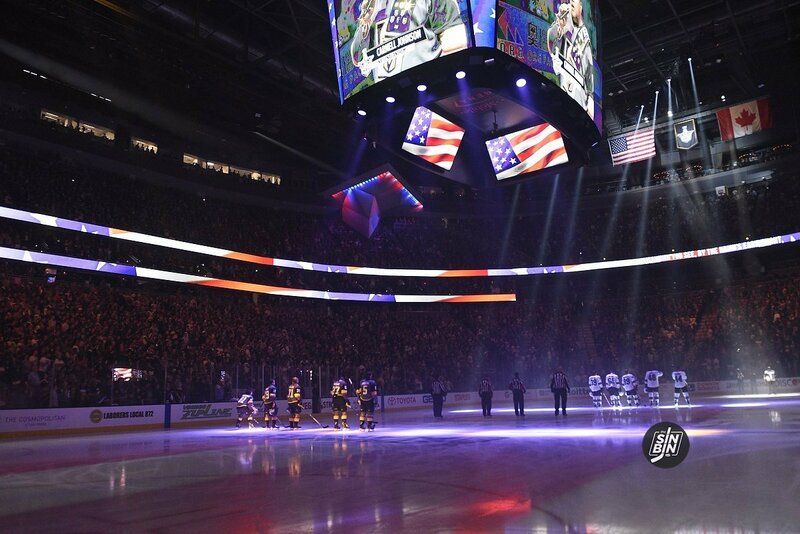 The opening game of the Stanley Cup Final, in Las Vegas, with an expansion team taking the ice. The stage was massive and the expectation was for something never seen before. This site was created to follow a hockey team, one that just won a game in the Stanley Cup Final, so we kind of have to start with the actual hockey. Thus, we’ll go at it backwards, beginning with the empty netter to seal the win and ending with some combination of Lil Jon, Travis Barker, Lee Greenwood. 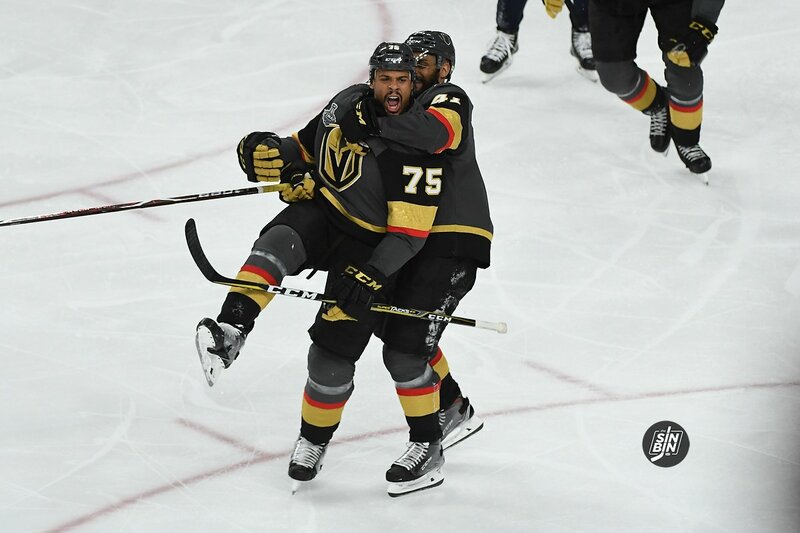 The Golden Knights hockey team cannot be defined in one way like many often attempt to, and on the biggest stage the sport has to offer, they proved it once again. Most of this postseason it’s been about Marc-Andre Fleury’s dominance between the pipes, yet tonight was far from his best. The Golden Knight defense has been carrying the torch slowing down the potent Jets and Sharks and allowing the Kings virtually nothing, yet tonight, they were a kind of a mess. The top line of Jonathan Marchessault, William Karlsson, and Reilly Smith can usually be leaned on to dominate stretches of the game, yet tonight they were hot and cold. Normally when plans A, B, and C go by the wayside a team is sunk Not the Golden Knights because they have narratives for days. Tonight’s is not a new one at all, it’s one that’s followed them all year and is constantly referenced even when not on display in a game. Tonight was about depth. 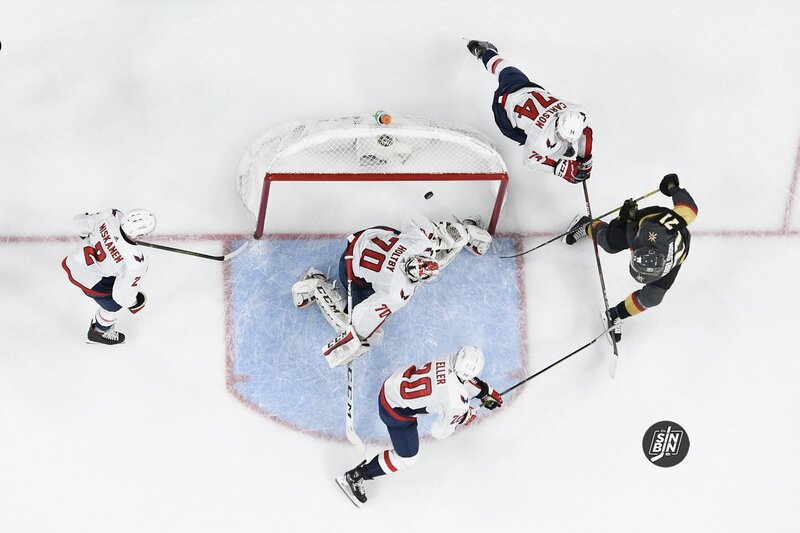 After playing a series in which there were zero lead changes in five games, the Golden Knights and Capitals Game 1 saw four, the most in the history of a Stanley Cup Final game. The last one was because of a trio of unanswered goals from none other than Ryan Reaves and Tomas Nosek, who scored two. There are so many different weapons in the Golden Knights arsenal. If it’s not Fleury, it’s the defense. If it’s not the defense, it’s the top line. If it’s not the top line, it’s the depth players. If it’s not the depth players it’s luck or bounces or opportunity or something completely else. In the end, no matter the path, it usually results in the same thing, a win. But the night was not just about the on-ice product, it was everything. Gladys Knight, Criss Angel, Lee Greenwood, Lil Jon, and of course Michael Buffer. Like the Expansion Draft with the players, it didn’t all make sense, no one really knew how or if it would all fit, but it did.